What It’s About: The trials and tribulations of up-and-coming rapper Alfred/Paper Boi (Brian Tyree Henry) and his cousin/manager Earn (Donald Glover), best friend Darius (LaKeith Stanfield), and Earn’s baby mama Van (Zazie Beetz) in a nightmarish vision of Atlanta. Why It’s Good: I knew early in the year that Atlanta’s second season, styled “Robbin’ Season,” would top this list. In fact, all it took was one episode, “Teddy Perkins,” where LaKeith Stanfield’s Darius visits a dark mansion to pick up a free piano and ends up the prey of a deranged musician (Donald Glover in eerie whiteface), for me to realize there’s nothing else that accomplishes what Atlanta does with even close to the same incredible style: deliver a new genre of television. Atlanta is pitched somewhere between comedy and drama. It runs between 22 minutes and 37 minutes on average. It is ostensibly a sitcom, but it loves to isolate characters during individual episodes and it doesn’t pay much attention to conventional sitcom structure. For instance, it never gives you the cathartic payoff at the end of each episode, as most sitcoms slavishly do. It casts a wide net of influences. There’s a touch of Twin Peaks here, a dollop of Louie there, more than a bit of the films of Harmony Korine and even the cartoon Adventure Time, but the full experience of Atlanta has never been done before. It addresses race in ways that make progressives eat their heart out, but it never reduces the black experience to a political hot-button or allows its characters to be anything other than complicatedly human. It’s hilarious, but it doesn’t resort to cheap gags or rely on jokes that are tied to current politics or the next big trend. It’s haunting, but absurdist, and more truly Kafkaesque than most postmodern literature pretending to the throne of The Trial and other great absurdist works. Atlanta is a show of the moment, capturing our angst and the messy politics that intersect our lives and leave us feeling alienated from our daily activities, but I have no doubt it’ll stand the test of time and prove to be one of those singular visions that captures the ethos of a time period, but also speaks to the human condition no matter time, place, gender, or race. What It’s About: Disguised as grotesque caricatures, including an Israeli soldier, a woke liberal arts professor, and a right wing conspiracy theorist, Sacha Baron Cohen interviews Americans, both famous and unknown, to get at the heart of America’s increasing dysfunction. Why It’s Good: This is undoubtedly the most controversial entry on this list, but people need to learn the definition of the word “satire” and apply it correctly, because in a year where satire that ripped Donald Trump and his ilk was much bandied about, Who Is America? is the only notable television show that actually embodied the concept. First off, Who Is America? is hilarious. Even at his worst (as in Grimsby), Sacha Baron Cohen is a shameless entertainer willing to go to absurd lengths to get a laugh; he’s fearless. But furthermore, Who Is America? is a terrifying reflection of what American has become today. You may think it’s a funhouse mirror, reflecting the realities of America in absurd and hilarious ways, but in actuality, it’s mostly a clear reflection of an ugly reality, and hardly an exaggeration. Real life has become satire. We’re all monsters depending on what side of the political divide you come from. Baron Cohen uses his gotcha-style of comedy to break the modern American down into its base parts, showing what an ugly, hateful, prejudiced creature it is. And perhaps what pissed people off the most, Baron Cohen didn’t restrict his attack to only the right wing. Donald Trump and his “deplorables” might be the easiest to attack for all their abuses and hateful notions, but all of America (right and left) is mentally-diseased and needs to be shown for the shameful wreck that it is. What It’s About: Con-artist turned lawyer Jimmy McGill (Bob Odenkirk) works to reclaim his law license after the death of his brother, while Mike Ehrmantraut (Jonathan Banks) becomes increasingly implicated in the criminal empire of Gustavo Fring (Giancarlo Esposito). Why It’s Good: The fourth season of Better Call Saul may be a slight step down after the climactic highs of its third season and the departure of Jimmy’s older brother/antagonist, Chuck McGill (Michael McKean), but it’s still television’s best slowburner. While most television shows pick up the pace and cram more and more plot into each episode, Better Call Saul slows it down and basks in the thrills of procedure. While most prestige shows want to make loud statements about current political and cultural reality, Better Call Saul digs deep into its own characters and leaves “topicality” at the wayside. It’s a show that’s rarely as violent as its predecessor, Breaking Bad, but is every bit as exciting and tense. And at its centre is Bob Odenkirk, constantly surprising with his verbal dexterity, his charm, and his ability to play several tones simultaneously. The season’s final scene, where Jimmy reveals his cold-hearted, manipulative self to his partner and lover, Kim Wexler (Rhea Seehorn), is a masterclass of layered acting. Like Jimmy does Kim, the scene lures us in with remorse and complexity and heartfelt confession, only to show all of that to be a lie and a long con, merely another brilliant calculation by a perpetual huckster. You bask in the expertise on display, even as it breaks your heart. What It’s About: Washed-up sitcom star BoJack Horseman (Will Arnett) deals with the death of his mother and a growing opioid addiction as he navigates his role on a new television series that mirrors his own life in uncomfortable ways. Why It’s Good: At this point, BoJack Horseman is unlikely to reach the highs of its third season, when it killed off Sarah Lynn (Kristen Schaal) and BoJack fled Los Angeles and a potential comeback series in order to dig into his own traumatic past. That’s because for a show about a depressive addict, rock bottom is about as dramatic as it can get, and season three is undoubtedly rock bottom. But there are still interesting things to explore after an addict hits his nadir, and seasons four and five have gone about exploring family trauma and how addiction rears its head in new ways in their respective seasons. The obvious season five standout is “Free Churro,” where BoJack delivers a eulogy for his mother, Beatrice, and explores his own complicated feelings towards the woman who is responsible for many of his own deficiencies as an individual. The filmmakers restrict the entire episode to BoJack’s eulogy, foregoing side stories or cuts to the show’s supporting cast. It’s another example of the show’s formal daring and emotional honesty. But what I found even more remarkable about season five is the show’s exploration of the opioid crisis, as BoJack becomes addicted to painkillers following an accident and spirals out of control once again. I don’t want all my favourite shows to tackle topics ripped from the headlines, but I don’t mind when they do so as perceptively as BoJack Horseman does. I’m not sure whether BoJack Horseman will stand the test of time like The Simpsons, but as far as entertainment that speaks directly to its era is concerned, it’s among the best. What It’s About: Based on Lawrence Wright’s Pulitzer Prize-winning nonfiction book, The Looming Tower follows members of the FBI and CIA, specifically special agent Ali Soufan (Tahar Rahim) and Counterterrorism director John O’Neill (Jeff Daniels), as they work to take down Al Qaeda in the years leading up to 9/11. Why It’s Good: This little-seen mini-series plays like reading a great work of nonfiction, which makes sense as it’s based off the Pulitzer Prize-winning book by journalist Lawrence Wright. The past couple years have been spent litigating how we got to where we are today, with most of that attention directed at how Donald Trump became President of the United States. However, the more important pivot point in modern history was 9/11, and sadly, the actual circumstances behind how that devastating terrorist attack was carried out was never made all that clear in western media. The Looming Tower is a corrective to all the misinformation, educating the viewer while also delivering an exciting procedural thriller. Operating essentially as a prequel to Kathryn Bigelow’s Zero Dark Thirty (it even features a character who’s meant to be the same individual as Maya in Bigelow’s film), this Hulu series explores 9/11 by focusing on everything but the attack itself: the terrorists who plotted it, the geopolitical movements that precipitated it, the bureaucratic infighting that enabled it, and the people who were caught up in its maelstrom. As well, in Ali Soufan, it had one of the year’s great performances and characters, and explored one man’s religious journey in ways that are rarely done on television. What It’s About: A blend of historical fiction and horror that follows the men of the H.M.S. Erebus and H.M.S. Terror as they become lodged in Arctic Ice during the Franklin Expedition to find the Northwest Passage and fall prey to a supernatural being that haunts the ice. Why It’s Good: The Terror is a punishing experience that’s riveting beginning to end. Essentially, what it does is explore the psychologies of a bunch of characters who embarked on an expedition to the edge of the world, which makes you sympathetic with their journey and daring, and then once you’ve grown attached to them, it forces you to watch them all die slowly in horrible agony. If the process of watching a show like this sounds masochistic, perhaps it is. But it’s also sublime horror that’s wonderfully constructed as a whole. The performances are riveting, especially Jared Harris as Captain Francis Crozier, Tobias Menzies as Commander James Fitzjames, and Paul Ready as Dr. Harry Goodsir, who gives a remarkably warm performance against such a cold landscape. The episodes move briskly and the production design captures the best elements of sub-zero shockers like The Thing as well as the stateliness of the best costume dramas. If you like horror and you like history, you’re doing a disservice if you don’t watch The Terror. What It’s About: Five narcissistic assholes run a bar in Philadelphia and habitually ruin the lives of each other and everyone they encounter. Why It’s Good: Even after 13 seasons, the filmmakers/stars of It’s Always Sunny in Philadelphia find new ways to flip the sitcom script upside down. As always, the show is hilarious, but what makes the thirteenth season so special is how it plays with hot-button issues in inventive ways. In “The Gang Beats Boggs: Ladies Edition,” the show comments on the recent spat of female-led reboots of popular properties, skewering the notion that said reboots are original or empowering. In “Time’s Up for the Gang,” the show plays with the implications of workplace sexual harassment and how hard-and-fast notions of consent could be weaponized by abusers. Most impressively, the show takes an issue as divisive as non-gendered bathrooms and creates a masterclass of comedic suggestion and interpolation, taking the notion of a bathroom as a safe space to absurd, but logically-reached, lengths. And I have to mention Mac’s (Rob McElhenney) postmodernist dance that closes the season, where the filmmakers refuse a comedic punchline and instead offer up something beautiful and moving and impressive. After all these years, this show still puts all other conventional sitcoms to shame. 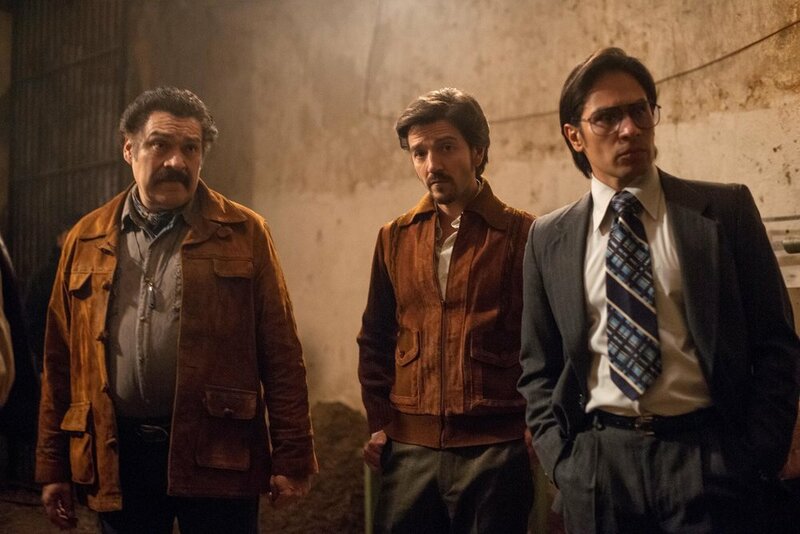 What It’s About: This spinoff series of Narcos chronicles the rise of the Guadalajara Cartel in 1980s Mexico and the conflict between marijuana kingpin Miguel Ángel Félix Gallardo (Diego Luna) and scrappy DEA agent Kiki Camarena (Michael Peña). Why It’s Good: The original Narcos series established an appealing formula in its tales of the Colombian drug trade centred around Pablo Escobar and the Cali Cartel. That formula used Scorsese-esque narration to let viewers in on the procedural workings of the world’s major drug cartels, while also detailing the work of the DEA agents working to bring them down. What makes Narcos: Mexico the best application of the formula to date is the strength of its two leads. In previous seasons, the lives of Steve Murphy (Boyd Holbrook) and Javier Peña (Pedro Pascal) were never as interesting as Pablo Escobar (Wagner Moura) or the Cali kingpins, Gilberto Rodríguez Orejuela (Damian Alcazar) and Miguel Rodríguez Orejuela (Francisco Denis). While Diego Luna’s Félix Gallardo is easily the most interesting character in this spinoff, Michael Peña’s doomed DEA agent Kiki Camarena is far more intriguing than his predecessors. Part of this is that he’s not the narrator: he’s a player in the story itself and his fate is key to the events of the Drug War in 1980s Mexico. The back and forth between Kiki and Félix and the dramatic tension it creates, where you always know more than either of the characters, gives you all you could hope for in a crime thriller. What It’s About: A documentary series about the Rajneeshee cult led by Bhagwan Shree Rajneesh a.k.a. Osho and specifically the events in the 1980s when the cult opened a compound in a small town in rural Oregon, leading to a series of conflicts with the government and the local Oregonians. Why It’s Good: There are shortcomings to the Way Brothers’ chronicle of the Rajneesh cult in 1980s Oregon, namely that in trying to offer a balanced perspective on the events, it overlooks some of the horrific abuses committed by the cult and does little to shed new light on cult dynamics. It also falls too firmly into the “both sides” editorialism that afflicts highbrow journalism of the moment. But I still can’t overlook two things, which is how thrilling this real-life story is, and how addictively the Ways tell it. Wild Wild Country is an expert weaponization of our modern ahistoricity, which results from the proliferation of the Internet, the 24-hour news cycle, and the ubiquity of progressivism. Much like Three Identical Strangers, it treats a story that was well-documented during the 1980s as if it has never been heard before, using newscasts, archival footage, and interviews with former and current members of the cult to relay the insane events around the Rajneeshees and how the story embodies the intersection of race, class, politics, and religion in America. Wild Wild Country does not give the whole story when it comes to the Rajneeshees, but it is as addictive and illuminating a documentary as I’ve seen in a few years. What It’s About: A paranoid schizophrenic (Jonah Hill) and an addict (Emma Stone) deal with alternate realities and journeys through their emotional trauma as they engage in a radical pharmaceutical trial in an alternate-present New York City. Why It’s Good: I wasn’t sure about Maniac after the first two episodes, but the third episode began to clarify what this series was about and why I found it strangely beguiling. As well, by season’s end, I realized the series is structured as one single eight-hour movie, even if it has fun with the individual episode structures throughout, and so, each episode was not meant to clarify individual themes but build upon a whole. Maniac is deeply weird and off-putting. Its world-building alone is confounding, essentially imagining a world where the Internet doesn’t exist, but instead, all of its services and realities are externalized in analog forms: for instance, in Maniac, people are not bombarded by pop-up ads online, but instead, an ad salesperson follows them around in real life and personalizes the ads for them specifically. But it’s this sort of off-kilter imagination that I loved. Jonah Hill and Emma Stone are deeply sympathetic in the leads and deliver the necessary pathos that’s required in a series that’s all about trauma and healing. But it’s Justin Theroux as the wacky, deeply-wounded scientist, Dr. James K. Mantleray, who steals the show, giving a big performance as a silly character, but also making his pain achingly palpable. It’s a tricky balance pulling off what Maniac does, and while the show isn’t seamless, it’s a series that’s special and all the more compelling for its uniqueness.